Since I do the myRIO stuff on a very old laptop, the compiles are painfully slow and consume virtually all my ram and cpu resources. I have a nice quad core in the next room that has "everything" installed. (Also lots of beta stuff). 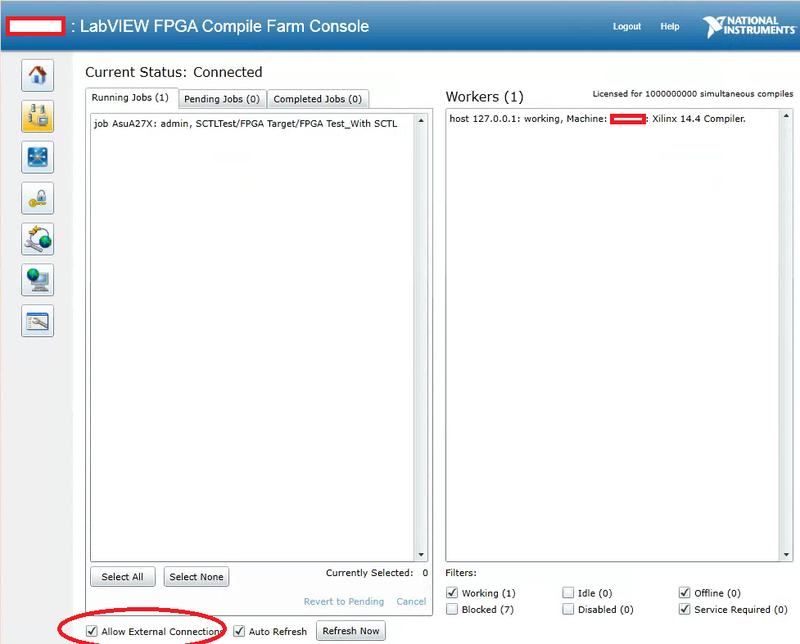 LabVIEW FPGA: The compile farm server does not have any compile workers that can perform this compilation. I thought I have everything installed there, including NI-RIO and such. Is there an easy way to find out what else needs to be installed so it can do myRIO compiles? Do you have the compile worker running on that machine? 1. Do you have an icon the system tray? 2. Searching for "FPGA Compile Worker" in the Start -> "Search programs and files" box and click on the item. Does the worker start? I've been playing with this lately for work. First, make sure your compile worker is running on your remote computer. You may have to start it manually through the start menu. Second, make sure your remote computer's compile server is set up to allow connecting to it. Again, in the start menu, there is a FPGA Compile Server Configuration. Open that up and make sure the check box is on. Third, make sure your local copy of LabVIEW is set up to connect to the remote server. This is done in the Options->FPGA tab. You can even test your connection from there. Also keep in mind that the compiler is actually just a single threaded application. So having multiple cores will not help one bit. Having lots of RAM and high CPU rate will. I had the same error and I had to install .NET 4.5.1 to fix the error. I am currently on the bus, will check later. If I configure the option to use a remote server and enter the computer name, then press test, it says that everything is OK. Only once I try to submit the job, it fails. I am aware about the single threading, but anything is faster than my <2GHz 8 year old laptop that only supports 3GB ram. Once the compile starts, I am getting very close to 100% usage in CPU and ram and doing anything else is nearly impossible. That sounds like you just don't have the Compile Worker running. Yeah, I dumped my compiles to a desktop with more power than my laptop (don't remember the specs right now) and it cut my compiles by about 1/3. It also helped that I did this little trick to put the compiler to a core affinity. Sent that core to 100% usage, but it cut down my compile time even more. We are working on getting a Linux server just for FPGA compiles. Thanks, I'll check the .net. Is this an automatic update or do I need to find it somewhere? I just downloaded it off Microsoft's site and installed manually. Tim was right, the compile worker was not running. I thought it would start automatically once I allow remote connections to the server. I'll study the documentation how to make sure it is always running. The sever configuration is a bit sparse with a single check box and a security warning. There would have been room for options to make sure the compile workers start automatically for example, or at least some additional instructions. Here's the console on the remote computer, showing the job. Note that there is no place to make sure the compile worker is actually started.